There are number of events ongoing this Friday, November 10th, so we highly recommend carpooling to this year’s Rice Energy Finance Summit. The primary parking areas will be the Central Garage and West Lot 1. 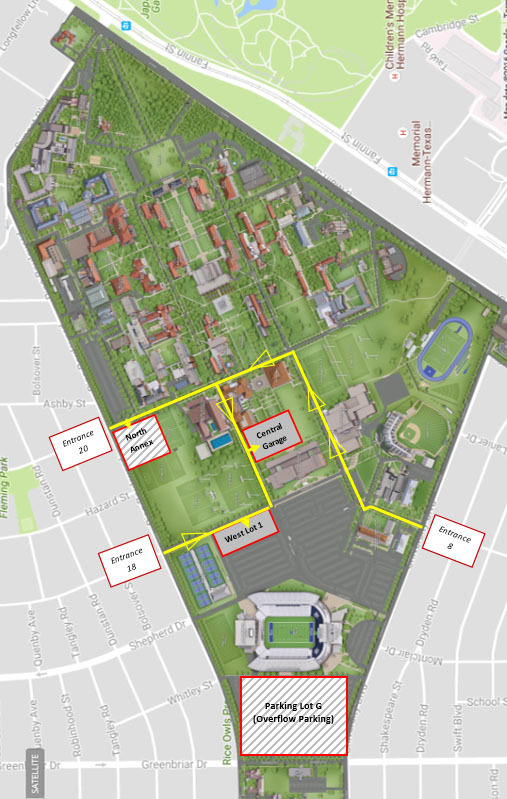 The overfill parking areas are located at the North Annex Lot and Parking Lot G.
Take advantage of Rice Bike Share and get a discount for attending REFS! Use code "11918"
Enter through Entrance 20 for access to the Central Parking Garage or North Annex. North Annex is located to the right. Turn right onto Laboratory Rd. at first intersection. Central Garage is located to the left. Enter through Entrance 18 for West Lot 1 parking. West Lot 1 will be located to the right. Enter right through Entrance 8. Turn left onto Laboratory Rd.